An important ingredient is missing from this account. This weekend in Madrid also happened to coincide with Andrew's 42nd Birthday (I know; he's very old). Now, prior to our weekend away, I had failed miserably to find the birthday presents that I wanted to buy, so I was rather hoping that Madrid might come up trumps in this quest. On the Saturday morning, I had to tell Andrew that I had some errands to run, dumped him unceremoniously near the Prado Museum and then hot-footed it around the city on the search for antiquarian booksellers. Madrid is a city that is easy to explore on foot, if you have a little bit of stamina. We were fortunate in that the very high temperatures we had experienced but a week earlier had dropped slightly, and so the weather was pleasant enough to support a bit of exercise. That said, could I find any antique books containing beautiful drawings of birds, insects or flowers? Could I hell! I trawled every antiquarian bookstore in the city, pretty much, and then returned to the parade of book stalls just beside the Botanic Gardens. This was my first port of call, and I had earmarked a particular seller who had listed two possible books on their website. The owner of the stall would bring the books for me to view if I were happy to wait for an hour. I did, marching around Madrid in the meantime, to return and collect said books. AW: While Ian was doing...god knows what...I decided to brave the Madrid metro and discover a different part of the city. Firstly Plaza de España and then on to check out the Pride Park in the largest green park, Casa de Campo, to the west of the city. The metro was easy to navigate and stress free which was a relief. We had bought a three day tourist pass which allows you to travel on any bus and metro unlimited for 3 days. 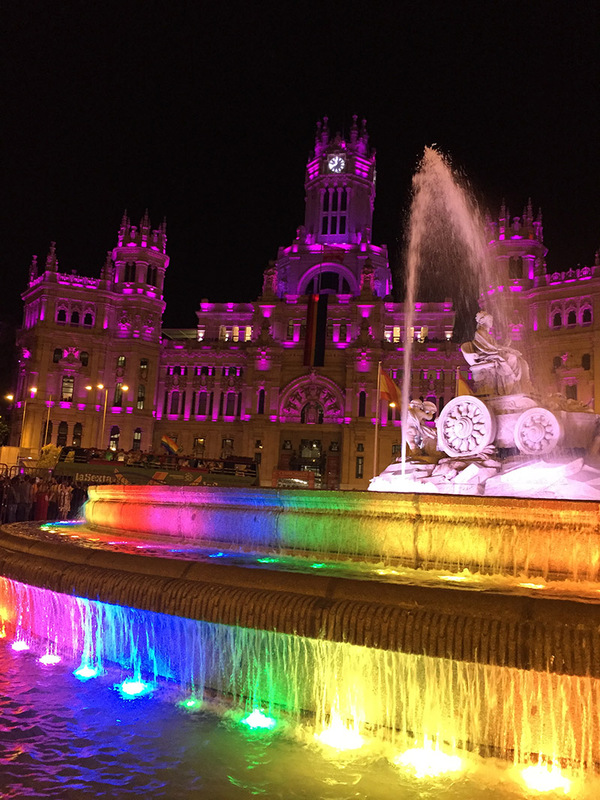 The park was beautiful with views of the Royal Palace and the Cathedral but the Pride village clearly didn't open until much later so I hopped back on the metro and headed for Chueca, the trendy gay area of Madrid where it was definitely all happening! Its like London's Soho but bigger, more friendly and less commercialised. It's full of independent clothing stores and bookshops; my favourite was a cook book bookshop called Cook Madrid. The main square in Chueca, where the metro station is, has a great selection of more modern bars and was packed with the most diverse crowd I have ever seen. The atmosphere was FUN! when Ian finally joined me (looking stressed and exhausted...what on earth had he been doing??) we ducked into the nearest tapas bar and filled our tums to prepare for what we suspected was going to be a 'big' night! Saturday was the day for the main Pride Parade - a procession that was due to start at 5pm and continue until midnight. I had also booked a table for Andrew's Birthdaydinner at the Bodega de los Secretos, one of many restaurants to be recommended in Madrid, which is fast becoming something of a foodie mecca. We managed our timings quite well, all things considered. We donned our rainbow-coloured tutus (purchased earlier from a Chinese Bazar where I was admonished by a rather mad Chinese lady for deigning to try the skirt on for size) and headed for the Prado. Here, we had a grandstand view from one of the concrete seating ares that run alongside the parade route, and due to our colourful attire, we found ourselves subjected to more than the usual amount of papping from passers-by. We loved this part of the afternoon. This was not just about the Spanish people, as the city was full of an additional 2 million visitors all here to experience World Pride. This was just one giant, good-natured party that went on day and night, across the entire city, and it was delightful in every sense. Having nipped back to our apartment for a siesta, we got the evening wear out and headed to the restaurant. The Bodega de los Secretos is hidden in a side street behind an unassuming facade; the restaurant itself is downstairs in what was once a winery. The food, ambience and wine were all lovely, and we had a rather romantic booth set away from any bustle. I hope Andrew enjoyed the treat! AW: He DID! We had, wisely, brought with us our rainbow tutus as we knew that, after dinner, we would want to see what other joys World Pride would deliver, and we made our way back to the main parade route to see that the schedule was not wrong! Some 6 hours after it started, the parade was still going strong, as were the surrounding crowds. Obviously, the streets here were closed to traffic, and there were just oceans of people out to enjoy the atmosphere. It is a sad truth that, at such occasions, people do get carried away, and it was a little traumatic to see so many of the beautiful green spaces in Madrid used as public toilets, when so much effort was made to provide facilities at very regular intervals. That said, there were so many people that I can understand that these facilities were stretched…. The scale of the celebrations were almost overwhelming. Turn one way, and there was a concert, turn another and you would have been treated to World Dance. It would have been easy to have felt slightly concerned in the wake of recent terrorist attacks in London, and knowing that arrests had been made in Madrid before the start of Pride, but how could these feelings prevail in a city that had so wholeheartedly taken this celebration to its heart? It seemed that everyone was out for a drink, to dance, to enjoy culture, music and people and it was intoxicating. Where we ate and what we saw. Before breakfast, we took a stroll along the southern edge of the gorgeous Parque de El Retiro, a vast expanse of greenery that was just coming to life with joggers and dog-walkers. On our next trip, I think this park will be one of our focal points, as it most definitely needs exploring. Today was, of course, the main Pride Parade, and I spent most of my morning foot-slogging around the city trying to find suitable antiquarian books! Our vantage point in the afternoon for the start of the parade was right outside El Museo del Prado on the Paseo del Prado, and what a great location it was. Andrew's Birthday (actually, pre-birthday) Dinner was at Bodega de los Secretos, and I think (I am speaking for Andrew here) we both rather loved the atmosphere and the food, and the cava went down a treat!